My interview with the French Defence Minister, Mr. Jean-Yves Le Drian appeared in exclusivity in today's edition of The Pioneer. 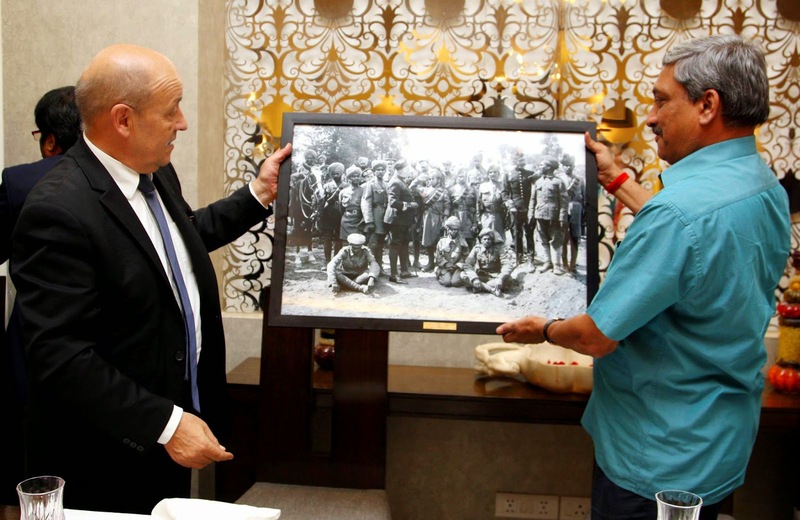 French Defence Minister JEAN-YVES Le DRIAN’s two-day visit to India was to meet his new Indian counterpart and also give a push to India-France defence collaborations. He spoke extensively to The Pioneer on the road ahead. Mr Minister, what is the main purpose of your two-day visit to India? First, it is to meet my new Indian counterpart, Mr Manohar Parrikar, just two weeks after the warm meeting between President Hollande and Prime Minister Modi. France and India share a wide range of common interests. Our strategic partnership, developing since 1998, when the BJP was in power, includes defence and security. It is important for our two countries to discuss our security concerns and our respective defence policies. I firmly believe that the defence partnership between two nations, that cherish their independence, strengthens their respective strategic autonomy. I have suggested to Mr Parrikar that we consider subjects of common interest, whether to do with international matters or defence policies, and these discussions have been extremely positive — as always between India and France — and marked by mutual trust and respect. We have important projects before us — such as the MMRCA — but that’s not all. Through unparalleled transfers of technology and their industrial impact, our projects will contribute to the Make in India programme in the defence sector, an area in which France already possesses major expertise. My trip particularly aims to see how the French defence industry can, in mutual interest, contribute to Make in India. Also, in this centenary year of World War I, I wished to pay tribute to Indian soldiers who fought on our soil for France’s freedom. Some 8,500 of these soldiers perished on our battlefields. We also haven’t forgotten those who fought in other theatres of war. What are the recent developments in the defence policy of the French Government? Where does India figure in this dispensation? There is, first of all, France’s resolute engagement in external theatres of operation against terrorism, namely in the Sahel, against Al Qaeda-linked outfits, and in Iraq, against the Daesh. Following our 2013 White Paper on Defence and National Security, which I presented in New Delhi, we reiterated our readiness to contribute to security in Asia, especially in the Indian Ocean, which is a major interest for both our countries. We also devote especial efforts to intelligence, cyber security, and space. With India, our cooperation can go very far. Prime Minister Modi has pressed for a global initiative against terrorism, which goes well beyond defence issues. This is something that interests us. As for armaments, an area in which we have been cooperating for the past sixty years, India is a very important partner. And this partnership can assume an unprecedented industrial and technological dimension in the years to come. Are you satisfied with the pace of the negotiations for the contract for the 126 MMRCAs between Dassault Aviation and the Government of India? What about the naval version of the Rafale (Rafale-M)? The negotiations are proceeding well. For a project of this scale and such complexity, which brings the transfer of numerous know-hows to several industrial stakeholders of India, the pace is comparable to that of other negotiations. Both our Governments share the will to conclude it and this is, of course, essential. The faster the contract is finalised and signed, the faster the jets will roll out of India’s manufacturing facility. Hindustan Aeronautics Limited will possess the technology and the licence to manufacture additional aircraft, which could, moreover, be exported. Thus, cutting-edge technology will be transferred to India, with production in India. The naval version of the Rafale is identical to the air force version. You see, the Rafale is truly an ‘omnirole’ aircraft. Just a few additional equipment, such as the landing gear, has to be supplied by French manufacturers. I want to underscore Rafale’s omnirole aspect. We have currently deployed this fighter jet for not only air defence missions, as in the recent case of providing air security for our Baltic allies, but also reconnaissance flights and air strikes in the Sahel and Iraq. No competitor of the Rafale can claim to have been tested so much operationally in such widely varying situations. And we manage to achieve this with an extremely high fleet availability level because of the Rafale’s great qualities. What about the other projects in the field of submarines, missiles, transport systems? Will France be ready to participate in a Make in India project? I won’t enter into the details of every project. What strikes me the most is the intensity of our cooperation, technology transfers and co-developments. All these ongoing and future projects well fulfil the objectives of Make in India. Let’s take two examples. The Scorpene is the first project in the world that provided for transferring manufacture to India from the very first submarine. This explains the programme’s delay, which is actually much less if we compare it to that of other ships, which involved far lesser complexity. Plus, there are no cost overruns. The project costs strictly adhere to what the French Government had announced to the Indian Government during negotiations. Moreover, they are lower. The cooperation between French and Indian manufacturers is excellent, and I am confident of the project being concluded successfully. We are ready to consider any other project that India may wish to launch for stealth submarines, equipped with appropriate missiles. The other example, the short-range surface-to-air missiles project was conceived to meet the expectations of our strategic partner, India. It aims to provide the Indian Armed Forces with cutting-edge technologies in the long term to enable them to possess the most high-performance systems. The SRSAM performances are unmatched by other missiles in this category. But the idea is also to have these missiles manufactured entirely in India, autonomously. To this end, we have decided together that the source codes of these systems will be shared. The contract has been ready for signing since March 2012. Then there are partnerships between companies, such as Tata and Airbus on military transport aircraft, which, once concluded, could pave the way for more ambitious tactical transport projects. Are there any other important defence projects that you have discussed with your Indian counterpart? In April 2015, we will hold a major aero-naval exercise, Varuna, off the Goa coast, which will enable us to exchange notes on our respective modes of action. This will be France’s maiden aero-naval exercise in the Indian Ocean, and we are doing it with India. Preparations are afoot between our respective Navies. I would like the nuclear-powered aircraft carrier, Charles de Gaulle, to participate. What about France’s military budget as some cuts have been announced in the Defence Multi-Year Spending Law (‘Loi de Programmation militaire’)? Quite the contrary. We are one of the few European countries to maintain our defence capabilities at a very significant level. I regularly call for European countries to make greater efforts. The military budget law you referred to has sanctioned spending for five years, in keeping with France’s role in the world and contribution to international security. I have just announced the acquisition of Airbus mid-air refuellers for our strategic air command. This includes the development of new independent technologies and the maintenance of nuclear deterrence capabilities in both its aerial and underwater dimensions.